An industrial robot is officially defined by ISO as an automatically controlled, reprogrammable, multipurpose manipulator programmable in three or more axes. The field of robotics may be more practically defined as the study, design and use of robot systems for manufacturing (a top-level definition relying on the prior definition of robot). Other robots are much more flexible as to the orientation of the object on which they are operating or even the task that has to be performed on the object itself, which the robot may even need to identify. For example, for more precise guidance, robots often contain machine vision sub-systems acting as their "eyes", linked to powerful computers or controllers. Artificial intelligence, or what passes for it, is becoming an increasingly important factor in the modern industrial robot. George Devol applied for the first robotics patents in 1954 (granted in 1961). The first company to produce a robot was Unimation, founded by George Devol and Joseph F. Engelberger in 1956, and was based on Devol's original patents. Unimation robots were also called programmable transfer machines since their main use at first was to transfer objects from one point to another, less than a dozen feet or so apart. They used hydraulic actuators and were programmed in joint coordinates, i.e. the angles of the various joints were stored during a teaching phase and replayed in operation. They were accurate to within 1/10,000 of an inch (note: although accuracy is not an appropriate measure for robots, usually evaluated in terms of repeatability - see later). Unimation later licensed their technology to Kawasaki Heavy Industries and Guest-Nettlefolds, manufacturing Unimates in Japan and England respectively. For some time Unimation's only competitor was Cincinnati Milacron Inc. of Ohio . This changed radically in the late 1970s when several big Japanese conglomerates began producing similar industrial robots. In 1969 Victor Scheinman at Stanford University invented the Stanford arm, an all-electric, 6-axis articulated robot designed to permit an arm solution. This allowed it to accurately follow arbitrary paths in space and widened the potential use of the robot to more sophisticated applications such as assembly and welding. Scheinman then designed a second arm for the MIT AI Lab, called the "MIT arm." Scheinman, after receiving a fellowship from Unimation to develop his designs, sold those designs to Unimation who further developed them with support from General Motors and later marketed it as the Programmable Universal Machine for Assembly (PUMA). In 1973 KUKA Robotics built its first robot, known as FAMULUS, this is the first articulated robot to have six electromechanically driven axes. Only a few non-Japanese companies ultimately managed to survive in this market, the major ones being Adept Technology, Stäubli-Unimation, the Swedish -Swiss company ABB Asea Brown Boveri and the German company KUKA Robotics . Number of axes – two axes are required to reach any point in a plane; three axes are required to reach any point in space. To fully control the orientation of the end of the arm (i.e. the wrist) three more axes (yaw, pitch, and roll) are required. Some designs (e.g. the SCARA robot) trade limitations in motion possibilities for cost, speed, and accuracy. Degrees of freedom which is usually the same as the number of axes. Acceleration - how quickly an axis can accelerate. Since this is a limiting factor a robot may not be able to reach its specified maximum speed for movements over a short distance or a complex path requiring frequent changes of direction. Accuracy – how closely a robot can reach a commanded position. Accuracy can vary with speed and position within the working envelope and with payload (see compliance). It can be improved by Robot calibration. Repeatability - how well the robot will return to a programmed position. This is not the same as accuracy. It may be that when told to go to a certain X-Y-Z position that it gets only to within 1 mm of that position. This would be its accuracy which may be improved by calibration. But if that position is taught into controller memory and each time it is sent there it returns to within 0.1 mm of the taught position then the repeatability will be within 0.1 mm. Teach pendant: Robots can also be taught via a teach pendant; a handheld control and programming unit. The common features of such units are the ability to manually send the robot to a desired position, or "inch" or "jog" to adjust a position. They also have a means to change the speed since a low speed is usually required for careful positioning, or while test-running through a new or modified routine. A large emergency stop button is usually included as well. Typically once the robot has been programmed there is no more use for the teach pendant. Lead-by-the-nose is a technique offered by most robot manufacturers. In this method, one user holds the robot's manipulator, while another person enters a command which de-energizes the robot causing it to go limp. The user then moves the robot by hand to the required positions and/or along a required path while the software logs these positions into memory. The program can later run the robot to these positions or along the taught path. This technique is popular for tasks such as paint spraying. Others In addition, machine operators often use user interface devices, typically touchscreen units, which serve as the operator control panel. The operator can switch from program to program, make adjustments within a program and also operate a host of peripheral devices that may be integrated within the same robotic system. These include end effector, feeders that supply components to the robot, conveyor belts, emergency stop controls, machine vision systems, safety interlock systems, bar code printers and an almost infinite array of other industrial devices which are accessed and controlled via the operator control panel. A robot and a collection of machines or peripherals is referred to as a workcell, or cell. A typical cell might contain a parts feeder, a molding machine and a robot. The various machines are 'integrated' and controlled by a single computer or PLC. The most essential robot peripheral is the end effector, or end-of-arm-tooling. Common examples of end effectors include welding devices (such as MIG-welding guns, spot-welders, etc. ), spray guns and also grinding and deburring devices (such as pneumatic disk or belt grinders, burrs, etc. ), and grippers (devices that can grasp an object, usually electromechanical or pneumatic). Another common means of picking up an object is by vacuum. End effectors are frequently highly complex, made to match the handled product and often capable of picking up an array of products at one time. They may utilize various sensors to aid the robot system in locating, handling, and positioning products. For examples of how this would look in popular robot languages see robot software. Positioning by Cartesian coordinates may be done by entering the coordinates into the system or by using a teach pendant which moves the robot in X-Y-Z directions. It is much easier for a human operator to visualize motions up/down, left/right, etc. than to move each joint one at a time. When the desired position is reached it is then defined in some way particular to the robot software in use, e.g. P1 - P5 above. 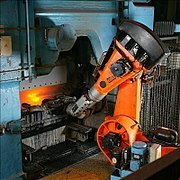 The American National Standard for Industrial Robots and Robot Systems — Safety Requirements (ANSI/RIA R15.06-1999) defines a singularity as “a condition caused by the collinear alignment of two or more robot axes resulting in unpredictable robot motion and velocities.” It is most common in robot arms that utilize a “triple-roll wrist”. This is a wrist about which the three axes of the wrist, controlling yaw, pitch, and roll, all pass through a common point. An example of a wrist singularity is when the path through which the robot is traveling causes the first and third axes of the robot’s wrist to line up. The second wrist axis then attempts to spin 360° in zero time to maintain the orientation of the end effector. Another common term for this singularity is a “wrist flip”. The result of a singularity can be quite dramatic and can have adverse effects on the robot arm, the end effector, and the process. Some industrial robot manufacturers have attempted to side-step the situation by slightly altering the robot’s path to prevent this condition. Another method is to slow the robot’s travel speed, thus reducing the speed required for the wrist to make the transition. The ANSI/RIA has mandated that robot manufacturers shall make the user aware of singularities if they occur while the system is being manually manipulated. As of 2005, the robotic arm business is approaching a mature state, where they can provide enough speed, accuracy and ease of use for most of the applications. Vision guidance (aka machine vision) is bringing a lot of flexibility to robotic cells. However, the end effector attached to a robot is often a simple pneumatic, 2-position chuck. This doesn't allow the robotic cell to easily handle different parts, in different orientations. Hand-in-hand with increasing off-line programmed applications, robot calibration is becoming more and more important in order to guarantee a good positioning accuracy. Other developments include downsizing industrial arms for light industrial use such as production of small products, sealing and dispensing, quality control, handling samples in the laboratory. Such robots are usually classified as "bench top" robots. Robots are used in pharmaceutical research in a technique called High-throughput screening. Bench top robots are also used in consumer applications (micro-robotic arms). Industrial arms may be used in combination with or even mounted on automated guided vehicles (AGVs) to make the automation chain more flexible between pick-up and drop-off. Prices of robots will vary with the features, but are usually from 7,500 USD for a bench-top model such as the ST Robotics R12 or the Fisnar dispensing robot and as much as 100,000 or more for a heavy-duty, long-reach robot such as the Kuka KR1000. The 2006 report (pdf) from the International Federation of Robotics shows that Japan leads the world in both stock and sales of multi-purpose industrial robots. About 60 per cent of the installations were articulated robots, 22 per cent were gantry robot, and 13 per cent were SCARA robots and 4 per cent were cylindrical robots. The majority of installations are in the automobile sector. There are increasing sales into non automotive sectors such as metals and plastics. In 2007 the world market grew by 3% with approximately 114,000 new installed industrial robots. At the end of 2007 there were around one million industrial robots in use, compared with an estimated 50,000 service robots for industrial use. The flags show where the global robotics headquarters are located. A comprehensive reference on the categories and applications of industrial robotics. Robotic Industries Association RIA (North America).